Shadow Warrior, a video game by Polish game creators Flying Wild Hog was one of the biggest surprises of 2014, with its colourful characters and explosive, over the top action. And it actually was a reboot of the old, 1997 Shadow Warrior game, but managed to outdo the old classic in almost every way. 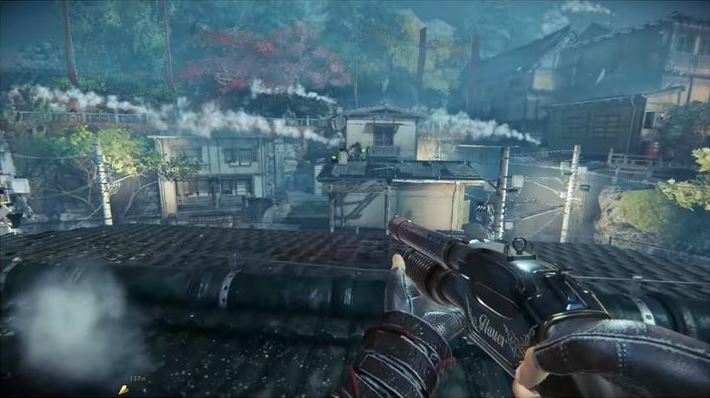 And now a sequel is headed to consoles and PCs this year, and judging by the gameplay video above, Shadow Warrior 2 is already looking like it could be one of the top action games of the year. As seen in the video, the gameplay in Flying Wild Hog’s game resembles that of classic shooters like Serious Sam and Doom, with countless hordes of enemies attempting to take down protagonist Lo Wang, a corporate shogun turned mercenary. But there’s more to Shadow Warrior than mindless gunplay, as Wang also has his trusty blades at hand to slice and dice enemies up close and personal. Actually, the melee combat in 2014’s Shadow Warrior was surprisingly good, on a par with the shooting action, which is certainly a notable thing in a first-person action game like this one. And it looks like Lo Wang will be teaching his enemies a thing or two about sword fighting in Shadow Warrior 2 as well, as he’s seen wielding dual katanas in the video and putting down enemies in Shadow Warrior’s trademark gory style. Also, developer Flying Wild Hog seems to have carried over the humorous dialog and comedy from the first game to the sequel, as heard in Lo Wang’s conversation with a character in what appears to be some sort of base of operations for Wang or hub area early in the game. And we’ll also get to enjoy Wang’s banter with a female magical character or spirit that will tag along with the hero throughout the game, like the funny demon character who was stuck in Wang’s mind throughout the first game. At some point in the gameplay video, Wang’s partner berates him for being a “pompous oversexed idiot”, but that’s the way macho, bigger than life characters work in games like this, and if Shadow Warrior 2 can match the intensity and fantastic mood of the 2014 hit then gamers who are fond of action games will be in for a treat when Shadow Warrior 2 is released later this year. Note: Shadow Warrior 2 will be released in 2016. Available on PS4, Xbox One, PC and Mac. Clarification: Shadow Warrior was released in September 2013 on PC, but the console versions (PS4 and Xbox One) were released in October 2014.